Three weeks in Cape Town have flown by. Other years I have always been at least five weeks, and with a bad start of being ill the first week, it felt like I just arrived when it was time to pack my bags again ;-). I had the warmest welcome ever. On my first day I went Stand Up Peddling in the ocean and a pod of dolphins came swimming next to me. So impressive, and so beautiful to see them swimming around my board. 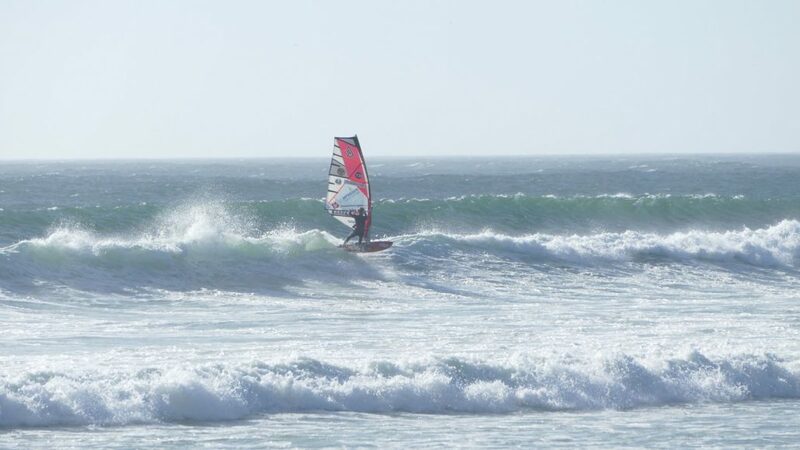 As a professional windsurfer I am always searching for wind & water. Cape Town is one of the most well known winter locations with consistent winds and lots of water to windsurf, surf and SUP in. But as you might have heard already, they don’t have much water to drink anymore. For the fourth year in a row I spend some time of my winter training in Cape Town. I love the country, the beautiful nature, the food and the the perfect beaches, waves and windsurf spots. Every day is different; there are so many spots you can go to, and if there is no wind you can go surfing, hiking, wine tasting, SUP, shopping, sightseeing and much much more. I uploaded my latest vlog about a typical day in Cape Town. (did I mention already they also have very good coffee? ;-)). I went surfing in Muizenberg for the first time this year as well, on a no wind day. It’s quite famous for good and clean waves, but also for their amount of white sharks in the water. At first, I thought I would think of it all the time. But just like with windsurfing, as soon as you are out there with so many other surfers you don’t think about it too much. Chances are so little. I always compare it with driving a car. Every day there is the risk of a crazy driver causing an accident or crashing in to you, but you can’t be scared of it all day. I went longboarding for the first time, and absolutely loved it. I still prefer to SUP, but as soon as there is a little bit of wind or it’s quite choppy, I prefer to have fun on a longboard. This year I had a 8’2 stand up paddle board and it turns soooo fast and easy, that I had days of supping over five hours a day because I just couldn’t stop. It was so addictive catching waves! I’m back in Holland for a few days now, and I have to keep reminding myself to flush the toilet after every visit. (just as I keep walking to the wrong side of the car to get in the car ;-)) That sounds crazy for most Dutch people, it’s not really (or really not) socially accepted if you don’t flush the toilet ;-). Just to be clear, it’s not that you never flush anymore in CT, sometimes you should flush.. like they explain on this flyer that a restaurant had hung up in their bathroom. With the freezing cold temperatures outside it’s so tempting to have a super long and hot shower when I get out of bed and my apartment is still cold. But after showering for less than a minute a day for the past three weeks in a row, a five minute shower feels pretty long and satisfying already. We had to put a basket in the shower, so all the water that got wasted while showering we could use again to flush the toilet with. You would shower with shorts stops (on – off showers) while washing your hair. Most of the time this meant that when the shower was finally getting warm I finished my one minute shower already ;-). I know there are still some tourists, windsurfers and visitors in the country who don’t want to sacrifice their long showers, their hot tub and other conveniences. Who are on holiday and don’t realise how big the issue is, they can leave again and don’t have to be scared of running out of water. But I hope people will realise that when you have the luxury to fly to another country and are already using the little amount of water they still have, we should together try to spill as little as possible and respect the rules. I feel so blessed to be able to travel so much, and although I know flying around the world is not good either, it feels like the least I can do is respect and create awareness for important problems like this. .
Every person should not use more than 50 liter water a day. To compare, in Holland an average person uses 120 liter water a day (including laundry, dishwashers, gardening, car wash etc). Everywhere in Cape Town you will find posters, flyers and stuff like that to make people aware of the water situation and you hear something about it on the radio every five minutes. I hope the rain season will be better this year and the government will find a solution for this huge problem. It opened my eyes on how much water we use in Holland, and although I highly enjoy my longer showers again it definitely made me even more aware! Besides all of this I had an amazing time again in Cape Town. I went wave sailing, free styling on several lakes, stand up paddling, normal surfing, went hiking.. it’s all possible in Cape Town. It’s freezing in Holland now and it was quite a big temperature difference I was facing. But I managed to do some ice surfing the past few days, which is definitely not the same as real windsurfing but pretty exciting as well. Here some shots to give a little impression of my three week training.